What gift can you truly give a capsuleer to commemorate the day of their birth? Honestly, think about it. As an immortal I would live forever. Birthdays had become nearly meaningless long ago. Furthermore, anything I desired I could simply purchase or take from the dead corpses of my enemies. I had few needs in life. It had been a long day for me, and I was drained. It seemed to be a repetitive statement towards my state of being at that point in my life and I was getting sick of hearing myself say it. I could only imagine those around me felt even more strongly about it. Fortunately, I was the eternal optimist, and the proverbial light at the end of the tunnel was growing bigger and bigger. There was most definitely an end in sight – I just had to dig deeper, push a little harder, whatever it would take. I had never been a quitter. Failure had never been an option and it wasn’t about to start to be. Good times never lasted forever, and neither did the bad. An unnumbered Roc’s Rule for you, free of charge. I nearly collapsed into bed that night, disrupting her sleep. She sighed, rolling over, wrapping her body around me. “I got you a birthday present.” she whispered. “Don’t be angry.” It always worried me when people prefaced things. “Alright.” I replied, genuinely curious. Gifts were an awkward thing. As I stated, I really had no need of anything, and there was a certain social obligation to appear grateful of the gesture regardless of its triviality. I wasn’t good at masking my few emotions either, so began mentally preparing my response, critically analyzing what the appropriate reply would be to not get me in trouble with this gorgeous woman. She reached over to her bedstand and pulled out an envelope. “Here you go.” she said, the shine in her eyes obvious. She was excited about this, nervous about my reaction. She knew me well. I hoped I wouldn’t hurt her and once again steeled myself, ready to put on a happy face of gratitude. I opened the card and saw a picture of an infant Minmatar girl. Her name was Mariela. I was intrigued and kept reading. Mariela came from one of the poorest rural areas of the Republic, but she was free. Her parents ran a small farm independent of their tribe, having escaped their Amarr masters years before. They didn’t have the funds to feed themselves and the father was to the point of begging his former master for mercy, giving up his family to the Amarr in the hopes they wouldn’t be punished or killed. His desperation to provide for those he loved was apparent. My response shocked me as much as it did her. I began to cry. This beautiful, sweet woman had given me something I was completely unprepared for. She had given me another opportunity to make a tangible difference, and at the end of the day, that was what I desired more than anything. I wanted to be the hero. It motivated everything I did. My heart raced with ideas. I wanted to kill their former Amarr master, giving his fortunes to this family and the other Minmatar still under his tyrannical thumb. I wanted to give millions of ISK to this family, granting them a life beyond their wildest dreams. I had to curb my enthusiasm. I wasn’t as naive as I used to be. A balance always had to be maintained. Too much generosity could have far-reaching unseen ramifications, and rarely did they turn out positive. No, I would help them financially, a little piece at a time, helping them get ahead but not in a way that would diminish the family’s honour or tribal pride. 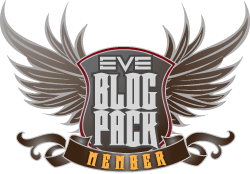 This entry was posted in Roc's Ramblings and tagged eveonline, Roc Wieler. Bookmark the permalink.